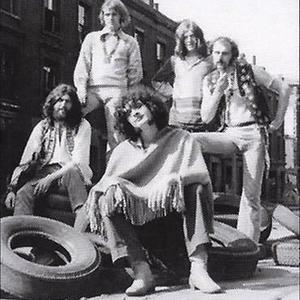 Founded by Mick Wayne in London, 1968, with Steve Chapman (drums) and Honk (John Lodge) on bass, they quickly signed a record deal with Denny Cordell/Tony Visconti Productions. They were managed by Blackhills (T.Rex, Pink Floyd, etc. ), who organized the Hyde Park concerts, and Junior's first gig with Traffic. Many other gigs and benefits followed closely, such as the Marquee, Roundhouse and Middle Earth in London and then various venues and festivals up and down Great Britain and Europe including Star Club Hamburg and Beat Club TV in Bremen. n 1969, they recorded their only album 'Battersea Power Station', followed by some singles. Grom (Graham Kelly) joined on vocals and Rick Wakeman was added on keyboards. John Cambridge who had earlier been in the Hullaballoos with Mick Wayne, and later with Mick Ronson, replaced Steve Chapman on drums, whilst Tim Renwick was added on guitar.Mick had been playing sessions for various people, including James Taylor, Joe Cocker, David Bowie ("Space Oddity"), etc. On advice of his managers, he moved to Los Angeles to continue his career. At Leon Russell's studio he recorded a new album. This master tape contained performances by various L.A. musicians, but was subsequently stolen from Island Studios, London.In 1972, Mick came back to London and recorded with Joe and Sandy Denny, Steve Winwood and Ringo. Subsequently, he joined Pink Fairies (1975), Tim Hardin (1976) and Phil Collins (1991).